On March 13, 1988, an Austria looked back on the 50th anniversary of the ‘Anschluss’, the Simon Wiesenthal Center won critical acclaim with the world debut of its travelling exhibition, THE COURAGE TO REMEMBER: The Holocaust 1933-1945, in Vienna’s Palais Palffy. Thanks to leaders in the educational community, elected officials, and all those who support Holocaust education, the Foundation for California, SNCF and our partners were able to bring the Simon Wiesenthal Center’s world-renowned “The Courage to Remember” traveling Holocaust exhibit to 40 cities and more than 800,000 people across the country in 2012. 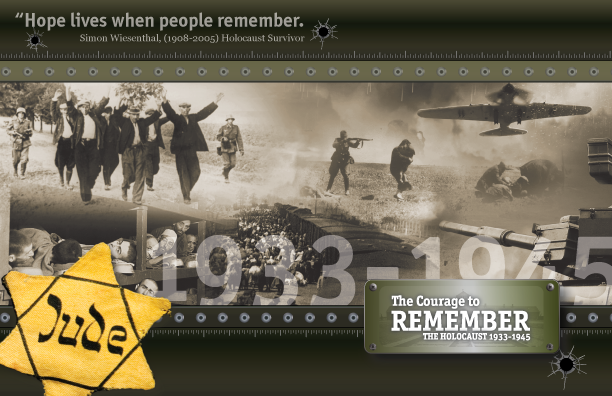 In 2012, opening events for “The Courage to Remember” took place in Tallahassee, FL; Modesto, Calif.; Clearwater, FL; Orlando, FL; Broward County, FL; Naples, FL; and the State Capitol Building in Sacramento, CA. These events brought out many interested residents and community leaders, including members of Congress, local elected officials, leaders in law enforcement, educators, students and the media. 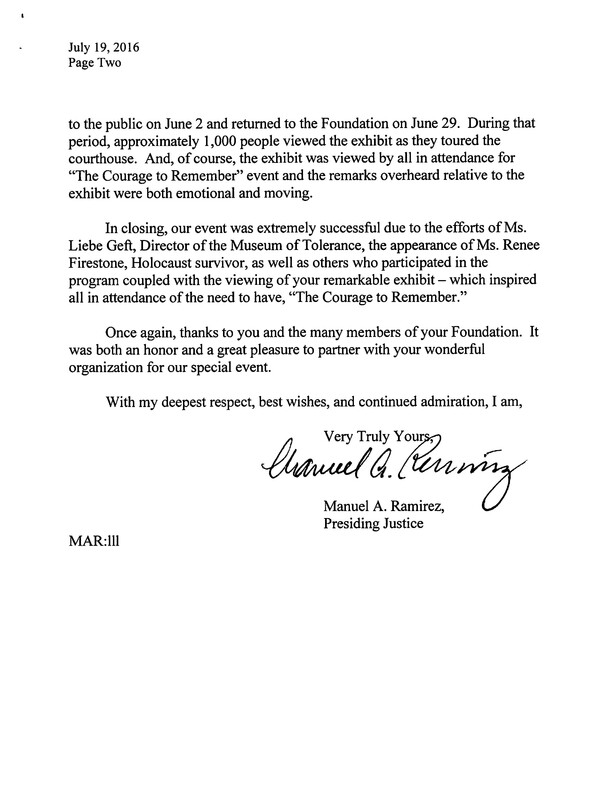 These events were widely attended, included speeches by various dignitaries, and each gathering honored Holocaust survivors and veterans. 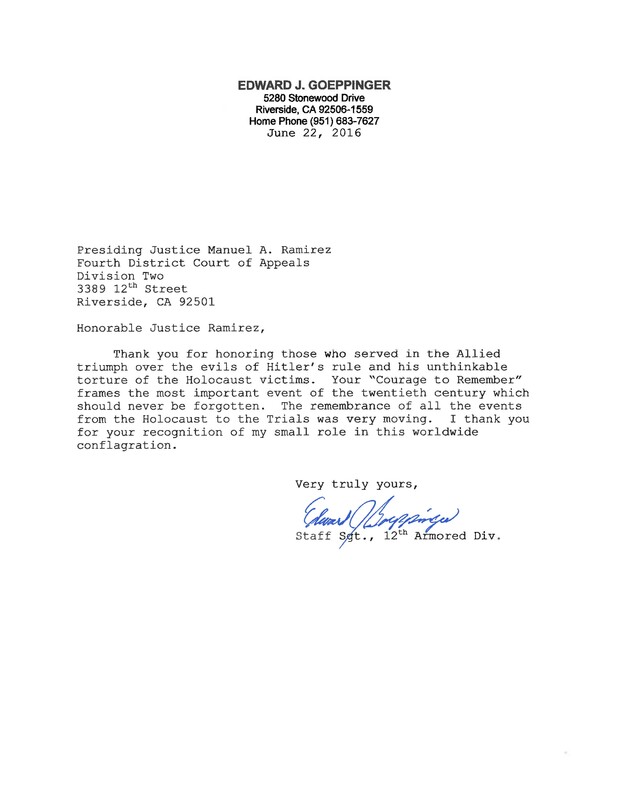 Simon Wiesenthal of Blessed Memory said, “Hope lives when people remember.” The Foundation for California looks forward to continued work with our partners to promote Holocaust education, memory and justice in communities across the nation in 2013. On behalf of the Foundation for California, I offer you my warmest wishes for a Happy New Year as we look ahead to 2013 and send a special thank you to our partners, the Simon Wiesenthal Center and its Museum of Tolerance, as well as SNCF America for its unwavering commitment to Holocaust education. 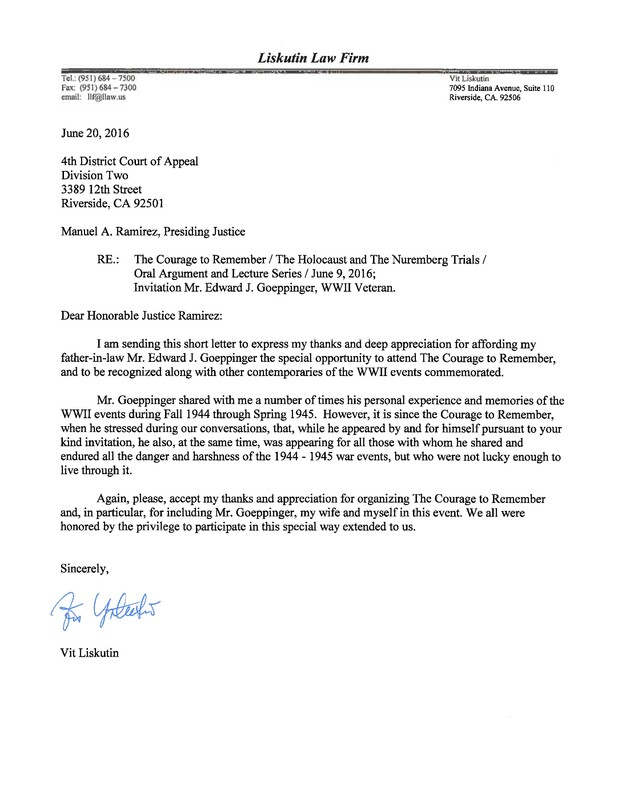 “The Courage to Remember” is anticipating an even more successful 2013 tour, with dozens of venues and special events scheduled. The “Courage to Remember” Holocaust exhibit is back in Orange County – and this time it is stopping at Westminster’s Asian Garden Mall. The exhibit, created in 1988 by the Simon Wiesenthal Center, offers 200 photos that take the viewer chronologically through the horrors of the Nazi’s systematic murder of more than 6 million Jews and millions of others. It opened this Tuesday and runs until Oct. 9. 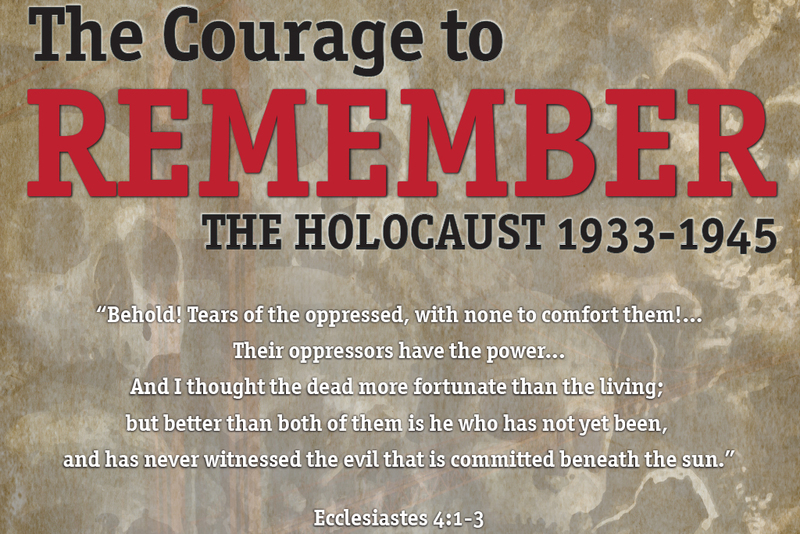 The “Courage to Remember” is meant to honor those who died from 1933 to 1945 as well as serve as a reminder of the atrocities that can follow racial, ethnic and religious hatred. “Hate crimes still go on, but hopefully by teaching tolerance, people will say, ‘Enough is enough,’” he said. The exhibit has traveled throughout the United States and to more than 20 other countries and has been seen by 4 million-plus. 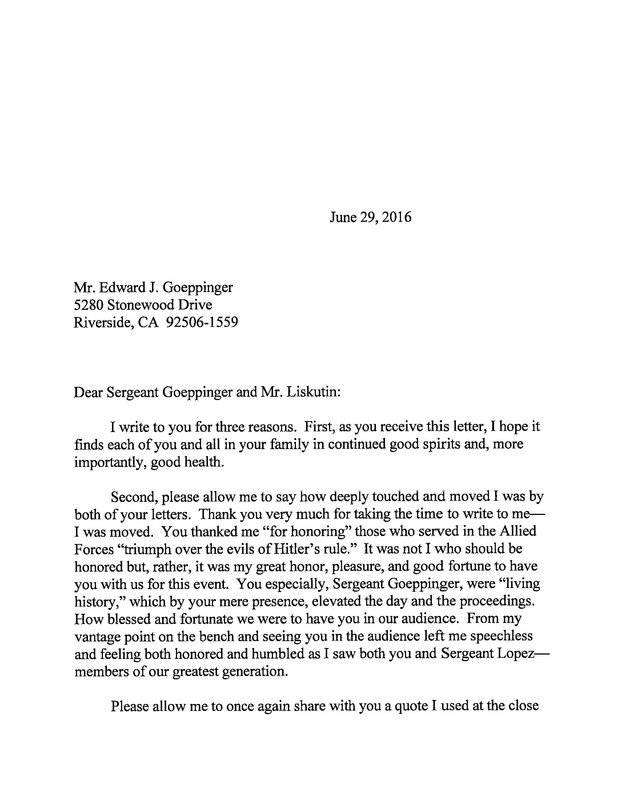 It was in Orange County a year ago in La Habra. The exhibit’s photos are unique. At the opening ceremony Tuesday, a dozen local officials stood with residents and the exhibit’s sponsors to welcome the exhibit to Westminster and the heart of Little Saigon. Having the exhibition in the Asian Garden Mall, Wilson said, illustrates the growing diversity of the country and the world – and, as a result, the increased importance of tolerance education. Where: Asian Garden Mall, 9200 Bolsa Ave.